Be specific about the error. “I have an error” “The PDF wasn’t created” ” “Cannot compile” “It doesn’t work” aren’t specific. Show what you’ve written in the code (see ‘Make an MWE’), what are the error messages that you get, attach the .log file (as an attachment, not paste the entire contents into the email/forum!!). State clearly your LaTeX distribution version (MikTeX 2.9? TeX Live 2013?) or package versions especially if you’re using one of the university thesis templates here. Give clear description about what you need. Do a “mockup” with Word or Excel if you have to, and attach the screen capture of that. 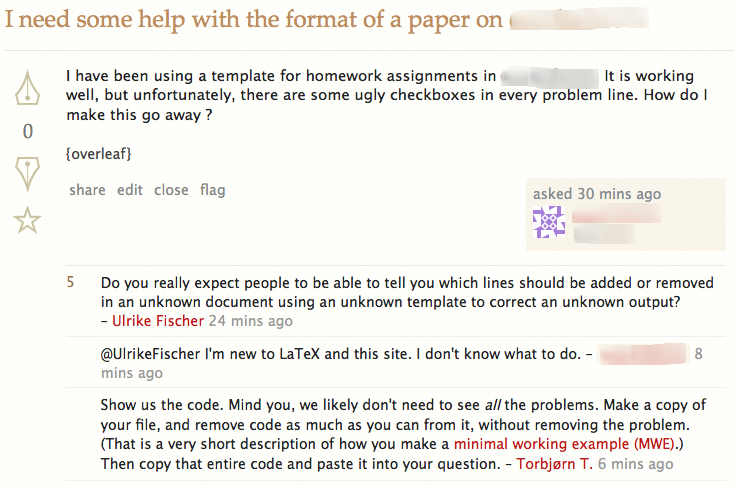 Show clearly what LaTeX code you have tried yourself and what’s wrong with it that you still need to change. That is, a minimal working example. Make the complete working code available, via Dropbox, on Google Drive, one of the online LaTeX platforms e.g. Overleaf, ShareLaTeX, Authorea, somewhere. Do not ignore error messages. Some IDEs will force-compile the .tex file and still get a .pdf file out of it, happily displayed. But there are error messages in the console or .log file. Some candidates ignore the error messages, as long as they have a .pdf. And then they need to change something in the docs, and asks for help. Not gonna happen; and it’s a bit of a tall order to expect other people to locate the n unbalanced parentheses in the entire project or 1.5MB .bib file. Please. Tolong. Help us to help you. Everyone wants to submit and graduate quickly, go about their lives helping people without getting too frazzled… and try not get too insane in the process.